Concern is growing in some corners that golf-ball litter is a growing problem. 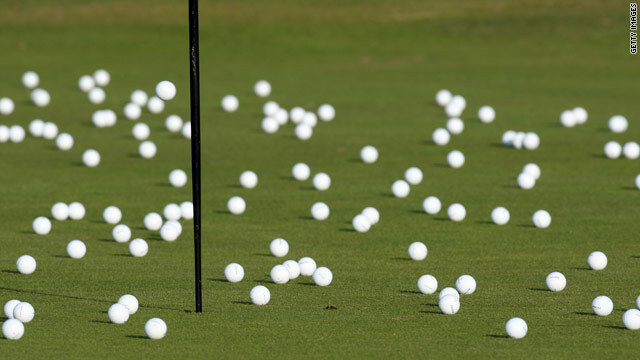 UK lawmaker says golf balls are "humanities signature litter"
London, England (CNN) -- Research teams at the Danish Golf Union have discovered it takes between 100 to 1,000 years for a golf ball to decompose naturally. A startling fact when it is also estimated 300 million balls are lost or discarded in the United States alone, every year. It seems the simple plastic golf ball is increasingly becoming a major litter problem. The scale of the dilemma was underlined recently in Scotland, where scientists -- who scoured the watery depths in a submarine hoping to discover evidence of the prehistoric Loch Ness monster -- were surprised to find hundreds of thousands of golf balls lining the bed of the loch. It is thought tourists and locals have used the loch as an alternative driving range for many years. The footage shot by underwater robotics team SeaTrepid, can be seen below. With an increasing number of golf balls discarded each year, the Danish Golf Association devised a number of tests to determine the environmental impact of golf balls on their surroundings. It was found that during decomposition, the golf balls dissolved to release a high quantity of heavy metals. Dangerous levels of zinc were found in the synthetic rubber filling used in solid core golf balls. When submerged in water, the zinc attached itself to the ground sediment and poisoned the surrounding flora and fauna. Course manager for the Danish Golf Union, Torben Kastrup Petersen, said the scale of the problem is unknown: "There has been very little research on the environmental impact of golf balls, but it's safe to say the indicators are not good. We are planning to collaborate with environmentalists in America to conduct more tests to fully explore the extent of the problem." Local government ministers in Scotland have also complained about the level of golf ball littering. UK lawmaker Patrick Harvie told CNN: "From the moon to the bottom of Loch Ness, golf balls are humanity's signature litter in the most inaccessible locations." And he's not wrong. On February 6, 1971, astronaut Alan Shepherd was filmed taking a swing with a six iron on the surface of the moon. According to Shepherd, the balls flew off in the distance and landed a few kilometers away. Although the balls were left for future golfers to discover, it is believed the extreme temperatures on the surface would have dissolved the balls many moons ago. In many cases, removing a partially degraded ball from a lake or woodland area could result in further damage to the wildlife. So what is the solution? Harvie had this advice: "Keep your balls on the fairway or invest in a stock of biodegradable balls." Does golf increase your stress?